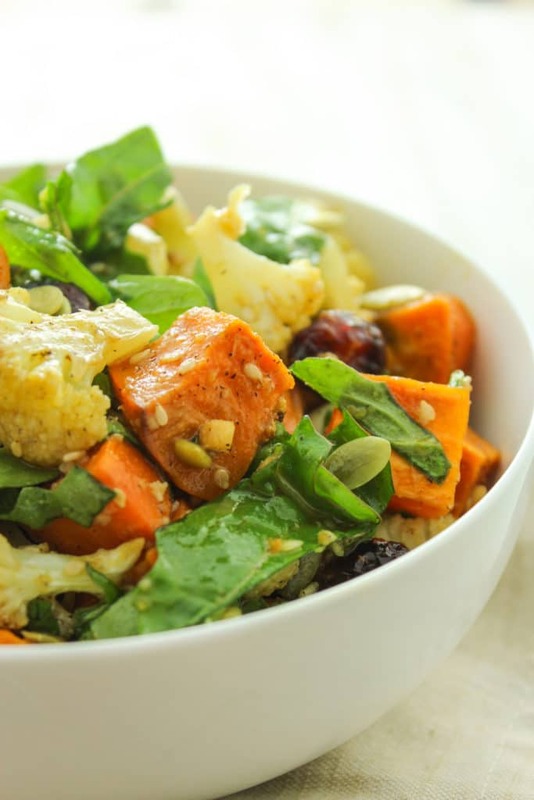 This salad recipe is great for holiday meals! 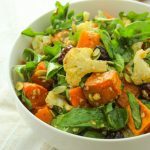 The roasted sweet potatoes, cauliflower, greens, and crunchy toppings tossed in a creamy miso dressing. What I’m about to say may shock you. It may even offend you. But it must be said. I don’t really like most Thanksgiving foods. Not the turkey. Not the candied yams. Not the green bean casserole. Not even the pumpkin pie. I may never know the answers to these questions, but since I’m a “grown-up” and we’re expected to bring dishes, I at least have the chance to make the meals more enjoyable.  I think it’s possible to achieve a happy medium by putting a unexpected spin on traditional ingredients. Casserole? Yes and yes. Dessert? Yep. Drinks? For the whiskey lover and the gin friend. I love sweet potatoes in all of their many variations, but I do not love them with marshmallows and brown sugar. I can’t do it. 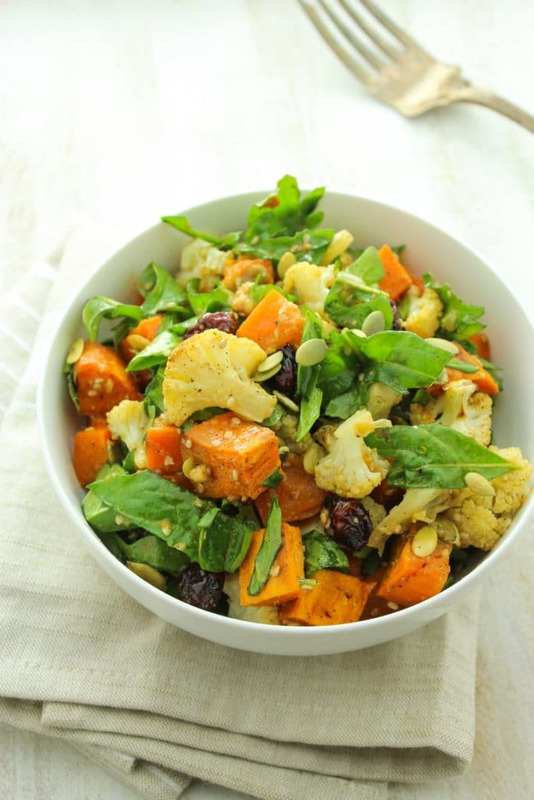 So instead, how about roasted sweet potatoes and cauliflower with spicy arugula mixed in, drizzled with creamy ginger and garlic miso sauce. Wait – it gets better. Tart dried cranberries brighten up the flavors and pepitas add a little crunch (and plus, they’re a little ode to pumpkin). It’s Thanksgiving side dish heaven. While we’re on the topic of Thanksgiving, I recently realized (thanks to Bon Appetit’s latest issue) that Thanksgiving leftovers seem to be a touchy subject. Some people are content to eat turkey/mashed potato sandwiches for a week after Turkey Day while some swear off of the foods a whole year. If you’re into leftovers, which we talked about last week, it doesn’t get better than this dish. Toss the salad in a skillet until it’s hot, then fry a couple of eggs to serve on top and finish it off with a drizzle of sriracha. Trust me, it’s . 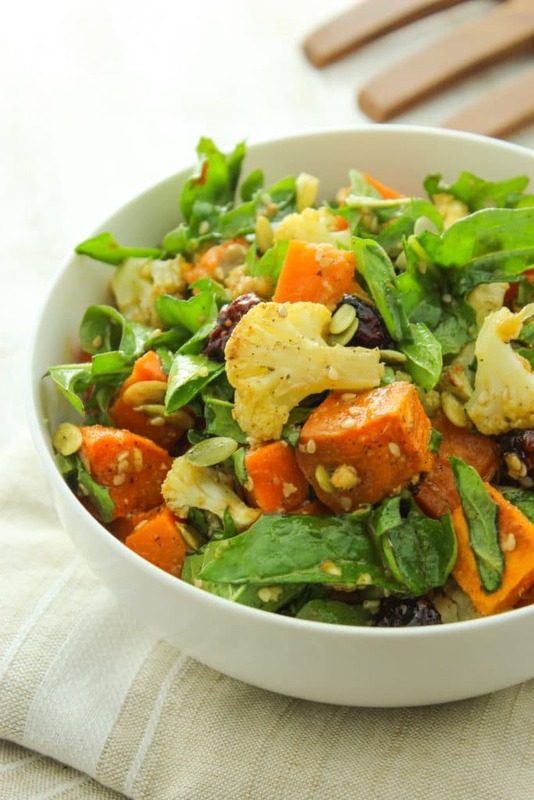 Roasted veggies, spicy arugula, bright cranberries and crunchy pepitas get drizzled with ginger miso dressing in this delicious side dish. 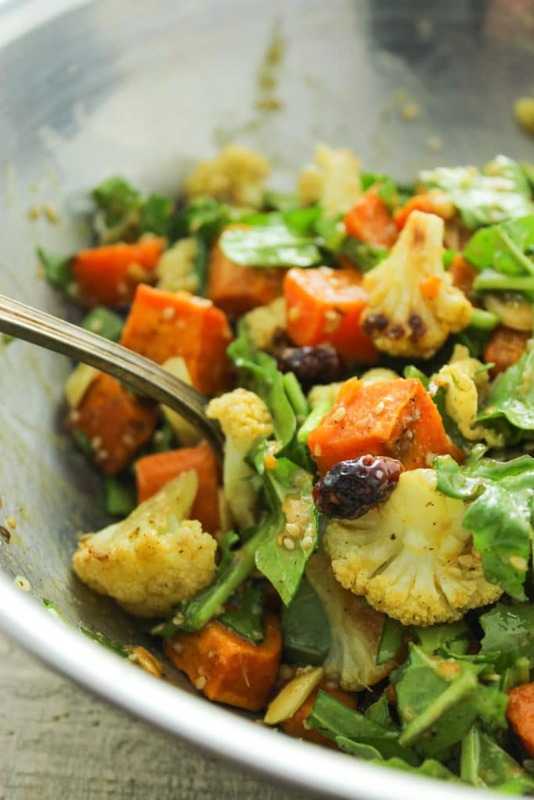 Spread veggies onto the baking sheet and drizzle with olive oil or cooking spray. Sprinkle with salt, black pepper, and white pepper. Bake for 23-25 minutes until sweet potatoes are fork tender, but not overcooked. You want them to be slightly firm so that they don’t fall apart when mixing the salad. Allow the veggies to cool, then empty into a large bowl. Add arugula, cranberries, and pepitas and stir in. After making miso sauce (instructions below), pour over the salad and gently mix until well-coated. 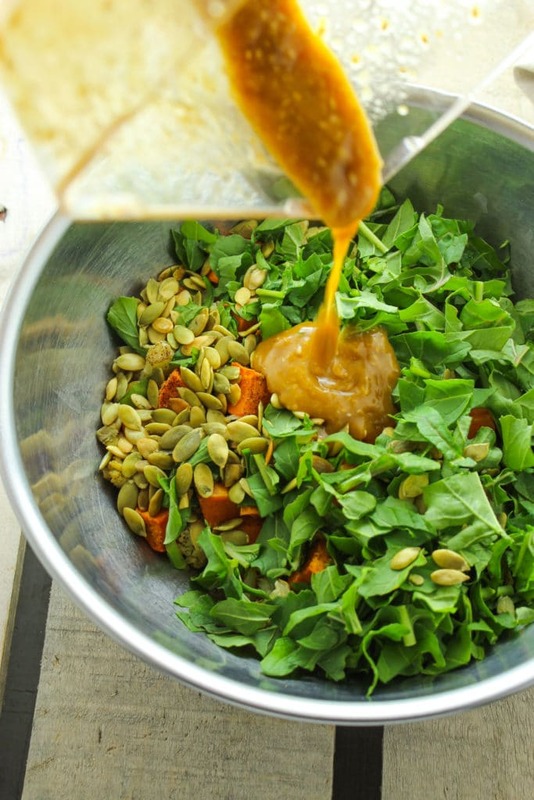 Add all ingredients to a blender or food processor – ginger, garlic, olive oil, maple syrup, miso, sesame seeds, soy sauce, and rice wine vinegar. Blend until smooth and garlic and ginger are pureed. Some sesame seeds will still be visible and not fully blended, and that’s ok.
Set aside until you’re ready to add it to the salad.